Kvasnosky's story celebrates all that is fresh and original in the creative spirit of children, and her text will be great fun as a read-aloud, especially after some practice. Kvasnosky and McGee's collaborative illustrations are done in gouache resist with digital colorization, a striking technique that particularly emphasizes the black night and the bright moonlight. All double-page spreads, the illustrations successfully evoke the vast beauty of the country the wolves inhabit. Visually lovely and sure to be a read-aloud hit; put on some Ella Fitzgerald, too. From the woodland, meadow, and mountain settings to the appealing depictions of the wolves, the distinctive illustrations were created collaboratively: Kvasnosky contributed the bold, black line drawings and textured effects, while her sister McGee—a landscape artist—added beautiful, soft, dusky colors. 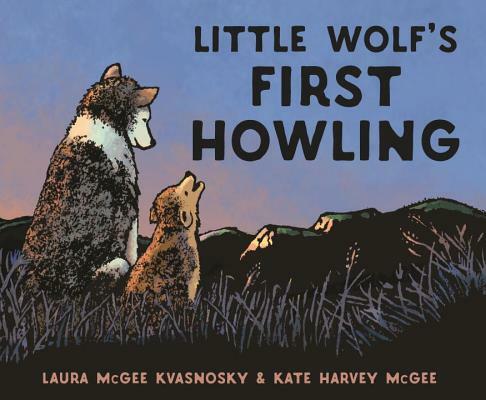 Written with economy and wit, this handsome picture book is a natural for reading aloud, and kids will be ready to help when it’s time to cut loose and howl. The perfectly paced narrative is filled with warmth and humor...Fun to read—and howl—aloud, this tale of tackling a first experience with originality and élan is ideal for storytime or family sharing. Little Wolf wants to make howling his own. In its nod to individuality and originality, this wise book is not just about growing up but also about being yourself. Laura McGee Kvasnosky and Kate Harvey McGee, captures the solemnity and playfulness of a wonderful father-son relationship. In moonlit illustrations, Big Wolf demonstrates proper howling form, but though his cub makes a sincere effort, he keeps veering into improvisation (‘skibbity skobbity skooo-wooooo’). It’s so endearing that eventually Big Wolf can’t help joining in.